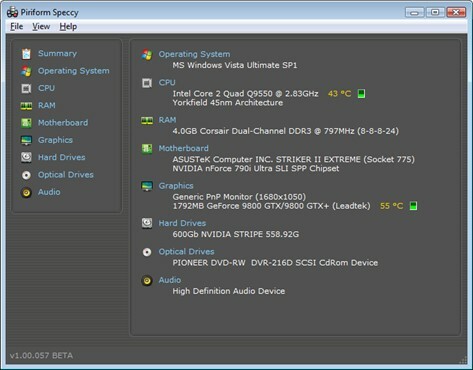 Speccy is an advanced System Information tool for your PC. What's in your computer? If you're like most of us, you can probably name the processor (Intel or AMD, Celeron or Pentium), maybe how much RAM it has, and maybe how big the hard drive is. When you go to a computer store and see all the bright shiny PCs laid out next to each other, most will have tags or stickers indicating the: Processor brand and model, Hard drive size and speed, Amount of memory (RAM), Graphics card, and Operating system. Two or three years later, when it comes time to upgrade your computer, that tag or sticker may be long gone. Speccy was designed as a free electronic "what's inside" sticker for your PC. Used it a few tmes. Used it to identify hardware and hardware specifications. 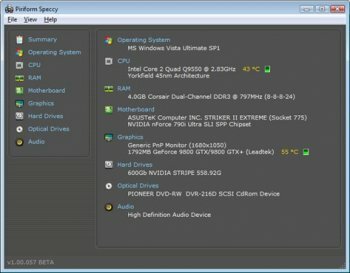 Highly recommended for anyone who wants to know a bit more about their setup. Very nice, FREE program. Unlike the ripoff prices some other similar programs charge. Yes it still can use more features, but it gets 5 stars from me for being free. Nice interface but it could look better as options . Agree with rk05. HP dv6 laptop running XP SP3 hangs. Uninstalled until they get it fixed. I don't know how you couldn't like this program. Straight forward, pleasing GUI, does its job. Worked without glitch on my Dell laptop with 64-bit Vista, including no lock-up when checking the hard drive. After searching the web to substantiate 'Jtaylor83's' claims the program is 'Super-Spyware' the only two sites that referred to ‘Speccy’ as 'Spyware' were blocked by both 'Malwarebytes' & 'Eset' simultaneously as ‘Malware’ sites themselves. I therefore conclude 'Jtaylor83' is a scaremonger & his/her comments should be ignored. 'Speccy' I feel is a good free program & worth having on any system. Speccy is a really great tool. This tells you everything you need to know about your own computer and it definitely beats having to install multiple programs for multiple pieces of hardware and such. I like it because it gives me a lot of useful information just in case issues start popping up and I have to refer back to it. I like it. Does what it says it does. This Program is now classified as "spyware" because it the new version steals your Windows Product Key along side with "Publish to Web" Tool. Running this on my HP laptop running Win XP, the computer locks up numerous times during the hard drive check. It locks up so bad that the mouse won't move, sometimes for several minutes at a time. This happened with this version and the previous one. The CTRL, ALT DEL won't even bring it back. The other Piriform products I use works great. Sorry guys. I have been a supporter of Speccy since its inception. I noticed on this release, 1.02, when the program is run, SPECCY.EXE opens a connection to mx1.k003k.com. Why? Works fine, but the name Speccy is already taken by a ZX Spectrum emulator.